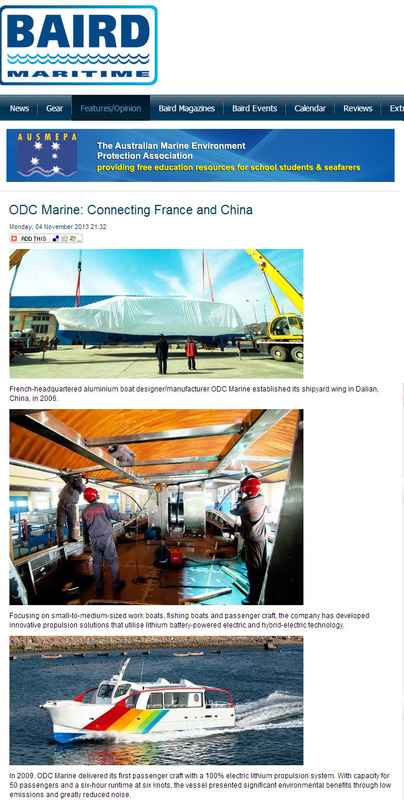 French-headquartered aluminium boat designer/manufacturer ODC Marine established its shipyard wing in Dalian, China, in 2006. Focusing on small-to-medium-sized work boats, fishing boats and passenger craft, the company has developed innovative propulsion solutions that utilise lithium battery-powered electric and hybrid-electric technology. In 2009, ODC Marine delivered its first passenger craft with a 100% electric lithium propulsion system. With capacity for 50 passengers and a six-hour runtime at six knots, the vessel presented significant environmental benefits through low emissions and greatly reduced noise. In 2011, ODC delivered a second, more advanced electric vessel, able to reach 11 knots and powered by two 75kW electric motors and a 300kW/h lithium battery pack. Leveraging this developing expertise with hybrid technology, the shipyard is now shipping its first hybrid diesel-electric passenger craft. Equipped with two 300kW diesel engines and two 75kW electric motors, these vessels can reach a maximum speed of 20 knots (when under diesel power) and offer two hours of autonomous run time at six knots with the electric propulsion.